It is a vegetable detergent, free of chemical thickeners, effective for hand washing of dishes. It’s a great neutral degreasing agent and operates with a derma-protective action, as it contains betaine. AQUA, COCOGLUCOSIDE, SODIUM COCO-SULFATE, SODIUM CHLORIDE, POTASSIUM COCOATE, ALCOHOL, CITRUS AURANTIUM DULCIS OIL, CYMBOPOGON FLEXUOSUS OIL*, CITRAL, GERANIOL, LINALOOL, LIMONENE. Wet a sponge and pour a little detergent over it, soap the dishes and rinse them. It is not necessary to pour the product directly into the water. 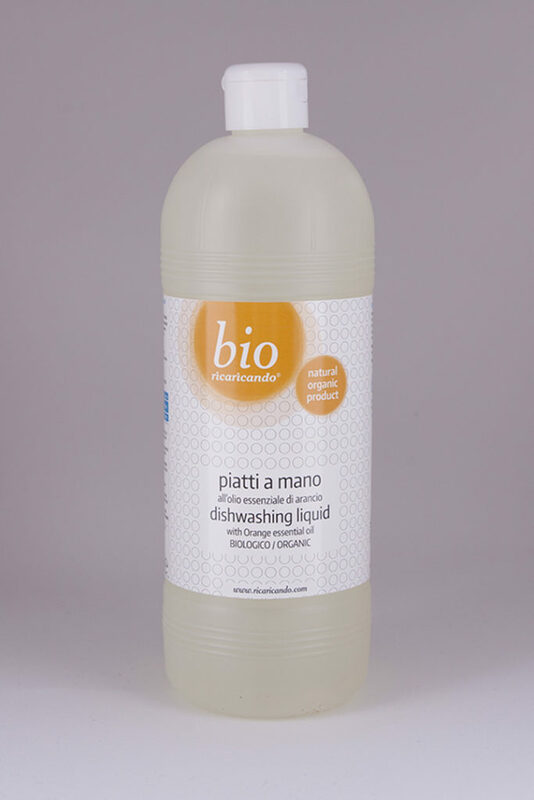 In case of tough dirt, we recommend the use of the stain remover Ricaricando Bio: wipe the dishes before the actual washing. Use the cooking water from the pasta that is already hot and contains the starch need to strengthen the degreasing action of the product. See table of doses for each 5 I of water.